This novelization of the hilarious monster comedy includes an eight-page insert of full-colour images from the film! 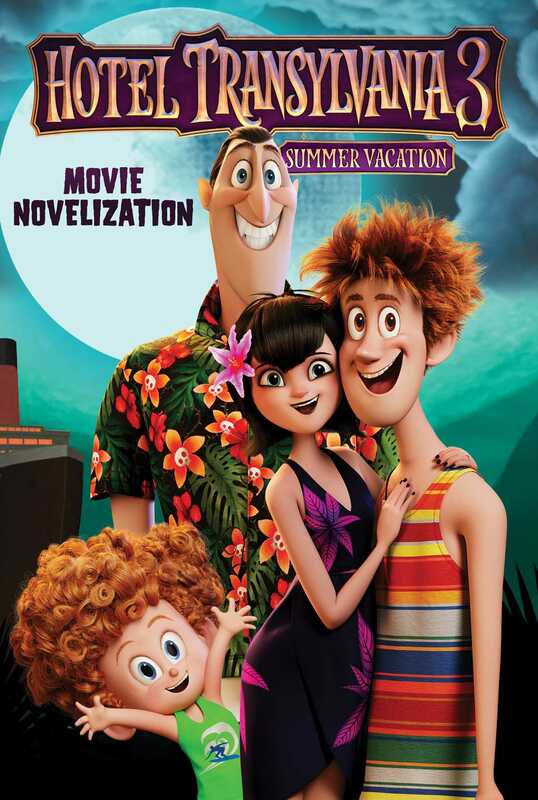 Sony Pictures Animation’s Hotel Transylvania 3—starring Adam Sandler and Selena Gomez—hits cinemas on July 27th, 2018! All aboard! Welcome to the Bermuda Triangle, where monsters embark on the cruise of a lifetime. Everyone’s favorite monsters are back, and this time, they’re funnier than ever. Join Dracula, Mavis, Johnny, Dennis, Frankenstein, Wayne the Werewolf, Murray the Mummy, Invisible Man Griffin, and more for a spook-tacular monster vacation that’s shore to be a good time. Find out what happens on this exciting cruise adventure in this hilarious monster comedy! The Transylvania Express barreled down the train tracks at top speed. Passengers dressed up for the journey. Riding a fine train like this one was a privilege. It was a beautiful day for travel. The conductor walked down the aisle calling out the next stop. “Budapest . . . Budapest . . . Ze next stop, Budapest.” He stopped as he approached five very strange-looking old ladies. They were all dressed in oversized overcoats and had their heads covered . . . so that the only skin that showed was their hands. The train conductor was used to odd-looking passengers. “Tickets, ladies?” he asked casually. The women all handed over their tickets to get punched by the conductor. “Here you go!” a high-pitched voice said. It was coming from a giant woman whose hand was blue and covered with stitches. “Here’s mine,” said the next woman, whose hand was pale and had long nails. “. . . and mine!” said another, whose hand was covered in fur. “Mine too,” said the next, whose hand was stubby and covered in bandages. “Here you go,” said the last one, whose ticket came from a gloved hand . . . but the wrist was invisible. The conductor either didn’t notice, or didn’t care. “Eh . . . thank you, young . . . man!” said the woman with the pale skin and long nails. The conductor didn’t realize these weren’t women at all. In fact, they weren’t human. This was a group of Transylvania’s finest monsters, known far and wide as the Drac Pack: Dracula plus his friends Frank, Griffin, Murray, and Wayne. They were all disguised as Eastern European old ladies. The conductor went back to punching tickets, and the monsters felt they could relax a little. “Man, I hate wearing disguises. These heels are killing me,” Murray said. His feet were crammed into tiny shoes. “I love it! I never get to dress up,” Griffin exclaimed. Since Griffin was invisible, he usually just wore glasses so his friends would know he was there. Too late. Frank had just noticed that a little boy was staring at them . . . and starting to whimper. “Pssst. Drac?” Frank whispered, but then the boy began to cry. “I’m about to undt freak out!” the boy said, in a German accent. Drac acted quickly to hypnotize the boy to make him think he was a cat. “You’re a nice kitty,” he said, and the boy began to meow like a cat. “I’m undt kitty cat. Meow, meow, meow,” the boy said, and licked his hand as if it was a paw. Suddenly the doors in the back of the train burst open. Abraham Van Helsing, carrying an impressively large device, stepped in. “Good evening, travelers! I am Professor Abraham Van Helsing. Yes! One of the Van Helsings! For centuries my family has battled monsters, so you can believe me when I tell you—there are monsters hiding amongst you!” His beady eyes scanned the faces of the passengers. “But fear not, for I am a professional and I know how to flush out these beasts and bring them into the light! Ahahahahaha.” Van Helsing cackled and took out a box of matches from his jacket. He lit a match and held it under Frank’s nose. Frank tried desperately to stay calm but couldn’t stand it. He jumped up and ripped off his disguise. “FIRE BAD!!! Raaahhh!” Frank roared. All the monsters started to flee, just as a man with a cart offering root beer floats and pies came down the aisle. “Root beer floats. Floats and pies . . . ,” he said, oblivious to what was happening until he was almost trampled by the gang. Pies and floats went flying. In a fit of fury, Van Helsing tried to blast the monsters. The Drac Pack climbed onto the top of the train and ran. . . . Van Helsing climbed up too, and they just barely dodged the blasts. As they jumped from one train car to the next, Van Helsing followed. When they got to the end of the train, Drac looked at his friends and then back at Van Helsing. “Sorry, guys,” he apologized as he pushed them off the train car to safety. Van Helsing cornered Dracula at the end of the last train car. “Finally! First I kill Dracula, and then the rest of the monsters!” the hunter growled in victory. He didn’t finish, because Dracula transformed into a mouse. “Eh, Squeak, Squeak,” Drac said. Just then, the train went into a tunnel and Van Helsing, still standing tall, smashed into the bricks. “Ahhh.” Van Helsing held his aching head. This was just the beginning of Van Helsing’s chase. The instant his head stopped swimming, the monster hunter got off the train and climbed into a biplane. He chased a bat as it swooped through the air. It was Drac! Next, Drac turned into a wolf and ran through the street. This time, Van Helsing chased him in a 1920s-style car. “I swear I will never rest until I destroy you—” Van Helsing said, but he didn’t get a chance to finish his sentence. Dracula disappeared in front of a brick wall, and Van Helsing’s car crashed with a SPLAT! Van Helsing refused to give up the chase. This time, the vampire simply appeared as himself, standing on the edge of a cliff. “And—” Van Helsing said, trying to tell Drac his message as he stalked closer and closer. The cliff crumbled, Dracula levitated in midair, and Van Helsing fell. In a cave, Dracula was in bat form. Van Helsing had his blaster pointed directly at the vampire’s head. “Every—” Van Helsing began to say the rest of the message, but he was cut short again. A stalactite fell from the ceiling of the cave. “Oooh,” he said as he watched it drop straight toward him. The next time Van Helsing cornered Drac, all he could say was “Other—” before a giant metal gate came crashing onto him. Van Helsing tried again. “Monster—” he blurted out, seconds before a giant spiky wrecking ball slammed into his face! Van Helsing tried standing in front of another wall. “If-it’s-the-last-thing—” he yelled out, as quickly as possible. Then a wooden cart slammed him into the wall. “I—” he tried, before a large battering ram crashed into his face. “Ever—” he said, as a rock smacked his head. “Doooooooooo!” Van Helsing yelled as he fell from the top of a large cliff.